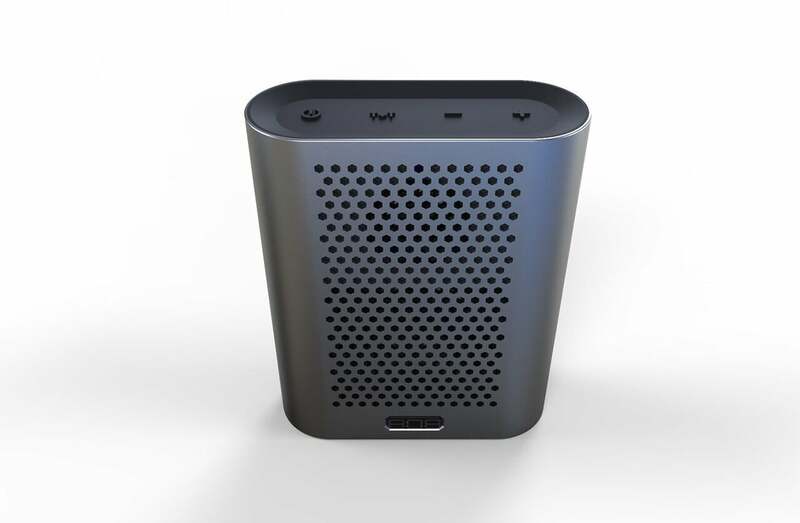 We like the bass response and the aluminum enclosure is a plus, but some features we've come to expect are absent, including speakerphone functionality and the ability to charge other USB devices. The number 808 carries great cachet in the music industry. It’s terminally linked with the insanely popular, retro Roland TR-808 drum machine, whose sounds can be heard on countless rap, hip-hop, and electronic dance music hits. If you call your company 808 Audio, you’d better deliver the goods. Does the company’s $60 Hex TLS deliver? Yes and no. It brings good looks and decent thump to the table, but not the stereo or complete feature set we’ve grown to expect from portable Bluetooth speakers. 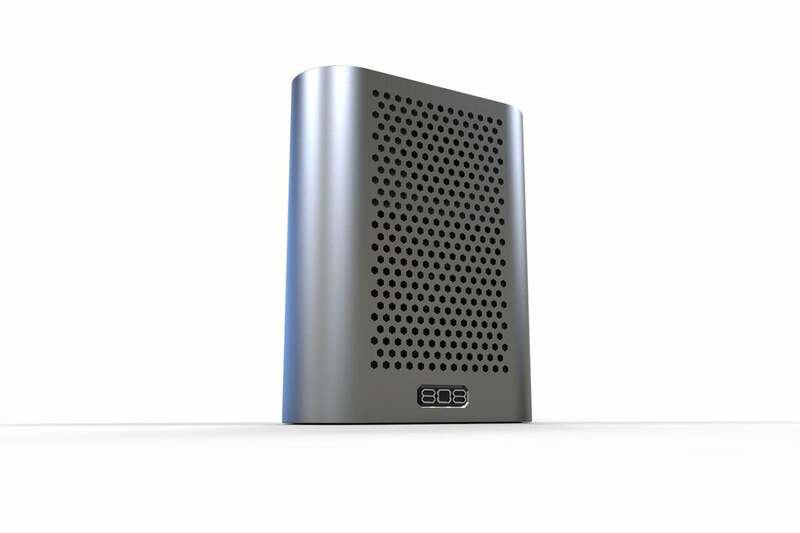 I call the Hex TLS’s design vibe funky industrial, thanks to the large holes in the front grill and the rear port in its anodized aluminum enclosure (it’s available in either blue or gray). The metal cones of its woofer and tweeter peeking through said apertures adds to the effect. Pictures describe the Hex TLS’s shape better than I can, but for the sake of getting paid—it’s has much the aspect of a large can of 3-in-1 Oil, sans spout.The speaker weighs in at 1.35 pounds, not including its AC adapter and USB charging cable, and it measures 4.85 inches wide, by 6 inches tall, by 1.87 inches thick. It’s solid but portable,. It’s an attractive design that fits into a backpack better than most of its competitors. The speaker is controlled by four buttons on top, several of which perform multiple functions: One is for power (long press), play/pause, and Bluetooth pairing (double-click), the second is for EQ bass boost, a third for raises the volume with a long press and skips a track ahead with a short one, and the final button lowers the volume and skips back a track in the same fashion. On the back of the Hex TLS are a 3.5-mm auxiliary input and a micro-USB charging port. There’s no facility for powering other devices. That’s a bit of a bummer, as is the absence of an onboard mic for speakerphone functionality. Those are features we’ve come to expect from Bluetooth speakers. Here’s the thing, in case we haven’t been quite clear enough—the Hex TLS sounds good for what it is, but what it’s not is stereo. Not that you can perceive stereo separation all that well with most single-body stereo Bluetooth speakers, but stereo is a marvelous thing. Combining the two halves of a stereo recording and pushing the result out from a monophonic speaker cabinet isn’t as easy as it sounds. Matching frequencies from separate channels can cancel or mask each other when married. Good mixes always tend to EQ individual elements uniquely, but you might not get the full spectrum of said element as you do in the original stereo mix. The HEX TLS doesn’t support TWS (True Wireless Stereo) either, so you can’t grab two and use them as a stereo pair. All that said, for a mono speaker rendering stereo source material, the Hex TLS pushes air in a rather pleasant manner, and with a fair amount of “oomph” (bass) for its size. The bass boost acts much like a classic “loudness” control, emphasizing bass and high frequencies. Without it, the Hex TLS’s emanations are a bit lifeless, so we left the boost on for all types of music. We wish it were a bit cheaper, but what the Hex TLS does, it does very well. 808 Audio claims about 8 hours of run time from the unit’s power pack. We saw about 6 at medium volume. The Hex TLS is a rugged, attractive speaker that delivers a fair amount of thump. I like the shape of its aluminum enclosure, too (and who doesn't like aluminum?). But I'd like it a lot more if worked as a speakerphone, could charge other devices (like my cell phone), and if it cost $40 instead of $60. The competition in this space is fierce, and 808 Audio needs to up its game. 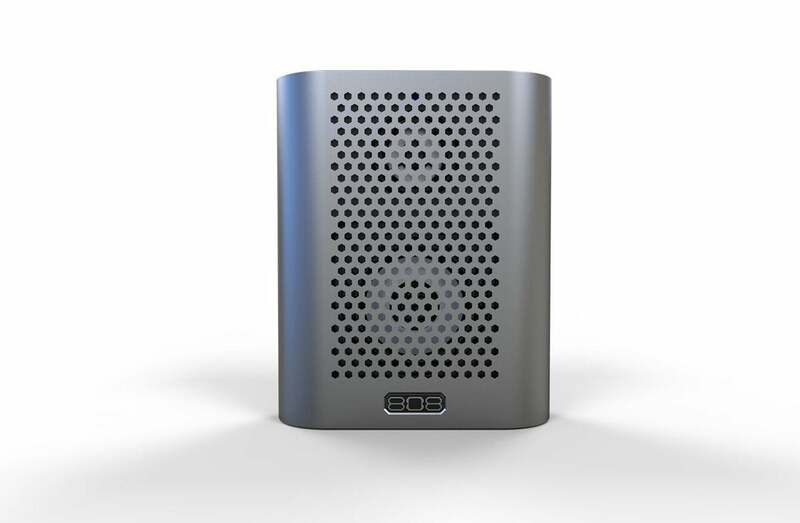 808 Audio's Hex TLS delivers thumping sound from an attractive aluminum enclosure, but it's monophonic, doesn't work as a speakerphone, and it can't charge other devices.